“If one can neither get away nor fight, then action becomes inhibited.When action has no way out, immobility turns into mutism. Inhibition becomes the only solution and leaves traumas in the body. 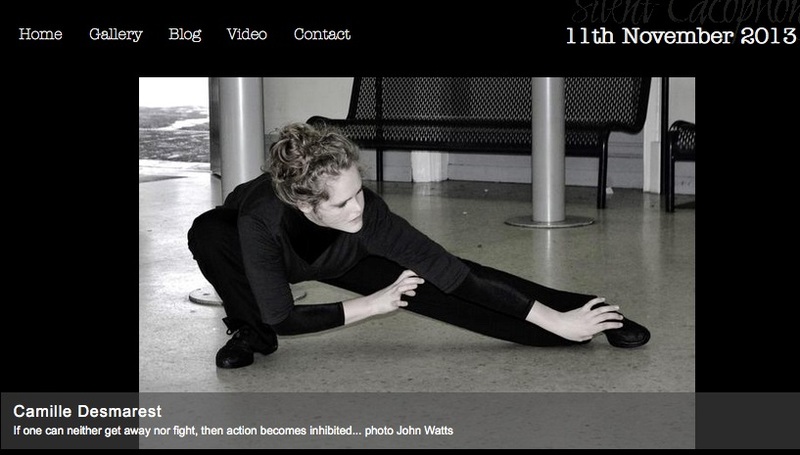 This dance piece looks into the shades of silence. Silence is what happens when words are not possible, when action is killed by impotency. Non-expression does not only mean resignation and acceptance. 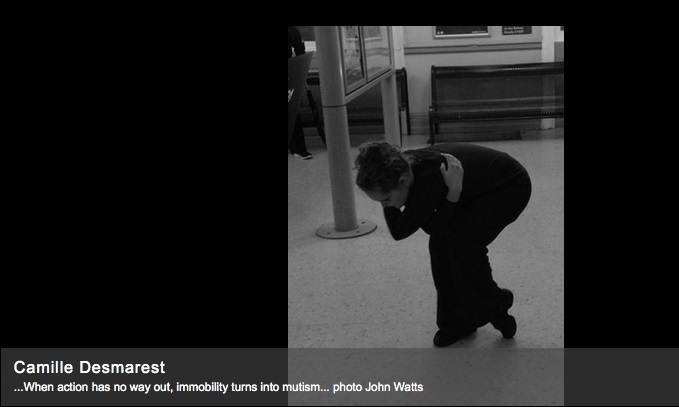 “A post by Camille Desmarest for her performance in Greenwich train station as part of Silent Cacophony 2013. “It is unbelievable what can happen when you simply genuinely ask for it. I am amazed by people’s generosity, availability and enthusiasm. I am incredibly impressed by the whole network of connections and interactions between people, despite physical distance. I have been making this piece in Paris, after living here for three years. I feel like I have not left. Thank you John for putting all the Silent Cacophony events together. Thank you Irena for asking me to be a part of it. 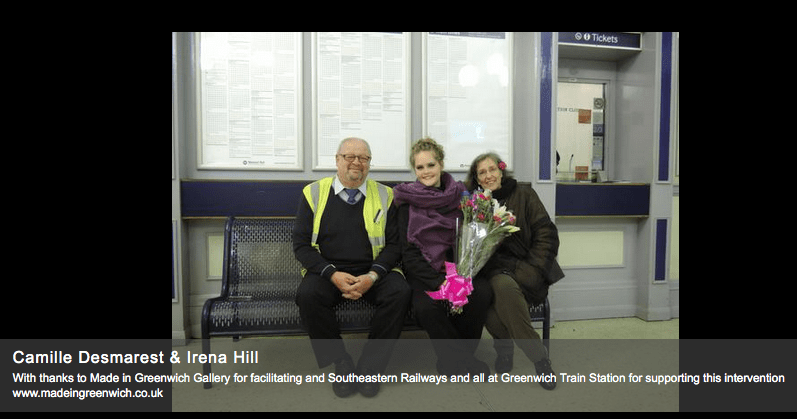 Thank you Sonia for allowing this to happen in the Greenwich station and all the staff for being incredibly cooperative with the logistic. Thank you GDA for hosting me so kindly over two days. It would be very hard without your contribution. I do not do “thank yous” because it would be nice, or because it is expected and conventional. I very sincerely felt I needed to tell them. I have always loved stations. I have spent lots of time in them, doing essays while skipping classes when I was at high school. Stations are a moving place by nature. Transitions where we only pass by. Who would go to a station if not to catch a train or pick up a friend ? Because I have often been around and about in cities, I have weirdly spent almost more time in tubes and trains than in the places I was going to. Somehow, stations and trains became somewhere, became a location in my everyday life. They have turned into bed, desk, office, kitchen table, and now stage. It feels right, and home. Trains and stations take the function one gives it. There are scary functions. I am very pleased to make the station a performing place. I like that anyone can watch or go, stay or pass by, make the effort to come to a station, or completely randomly arrive on a performance time. “One month has now passed since I have been postponing writing some lines about the performances I did for Silent Cacophony. I think it is enough waiting. I am still not sure what I have been waiting for, which sort of revelation I thought would happen to me? Practising writing anyway, I did write some notes straight after the performances, trying to capture some snapshots of what just happened. I was trying to put down the specificity of the dancing that had just happened, and how very different it was from the previous one. Each of them had its own characteristics, like family members, all different, but with a resemblance. “Dazzling sun. Full and empty space”. Although I am used to doing something over and over, I am amazed by how different it still is everytime, and how much it can vary from one time to another. If I concentrate, I can remember each performance precisely, its atmosphere and how it felt in the moment. But thinking generally about The inhibition of action, all the performances together have merged into one long dance, with different parts and intermissions. 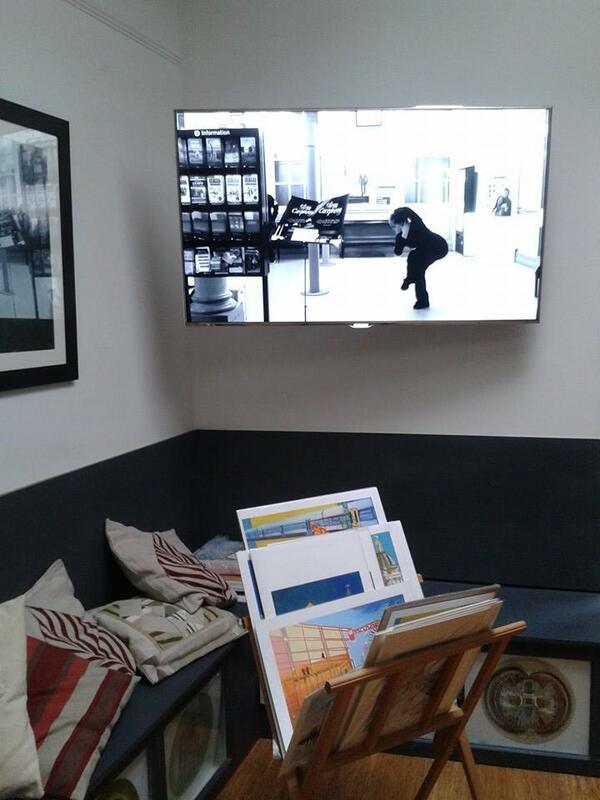 The video has been displayed in the Made In Greenwich gallery (324 Creek Road SE10 9SW London) in Octobre 2014.